I completed 128 total projects – roughly 1 item every 2.5-3 days or 2-3 finished projects per week. 2014 was the year of the “Independent Pattern” designer. 67% of the projects I completed were not from “traditional” pattern companies. Of those companies, I only used Kwik Sew and New Look (I did start a McCall, but it’s still in the WIP pile). 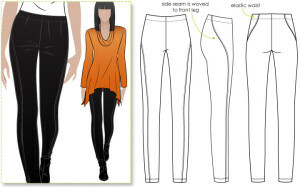 Of those Independent Designers, Jalie was once the most sewn followed by Style ARC, Papercut Patterns, GoToPatterns, Ohhh Lulu, and Peek-a-boo Patterns. 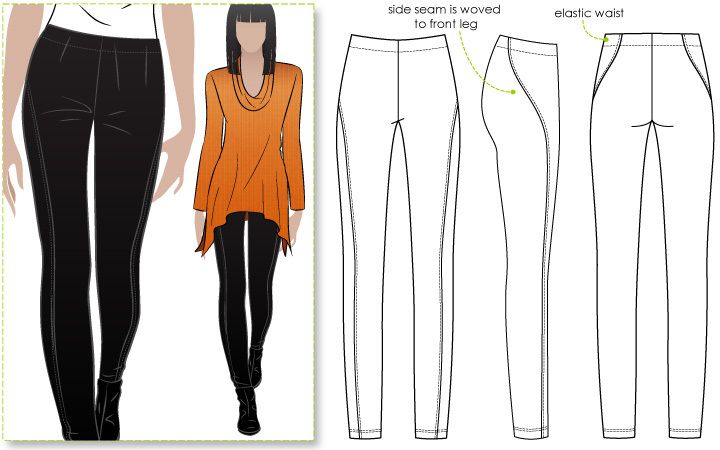 31% of the patterns sewn were self-drafted. StyleArc’s Ziggi Jacket. Not only was there a fun sew-along that went with this jacket, I love the end result and the fit was spot on. The Get Carded Wallet. I found myself making this cute little wallet by Dog Under My Desk several times throughout the year and had numerous requests to make this item. It was a fun sew, it stitched up in about a day, and the results were beautiful. The Pattern Anthology Make Believe Collection (includes the Imagine Jacket, Explorer Hoodie, Adventure Tee, and Bookworm Button-up). Alright, I know this is a collection, but it counts as one, right? Not only did we pattern test for this collection, but I was able to stitch something up for my son – which I rarely get to do. Not only was he thoroughly excited about the prospect of having me make something, he helped ‘design’ his clothing, took some great photos, and loved wearing everything. The Comino Cap. This Kitschy Coo design sewed up quickly and the end result is just, ‘wow’.  I’m on the hunt for material to make one in cotton. Midtown Messenger – This was another one of those patterns that I liked so much, I made it several times…. and my daughter took them all. 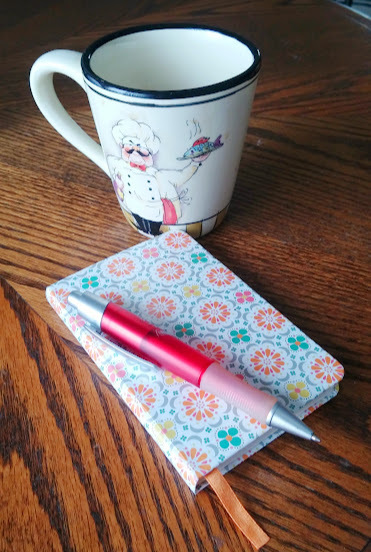 You may see at least one more of these patterns in 2015 just so I can keep one for myself! This entry was posted in General on December 31, 2014 by stacy. I have wanted a slouch hat ever since I saw Tatiana Maslany wear one in the first season of Orphan Black (if you haven’t had a chance to check out this show, I highly recommend it)…. so when winter gear came out this season I snagged the first cute beanie that I found. Not exactly what I wanted, but close. Then I saw this tutorial a few weeks ago and decided that Easton needed one too – beanies for everyone! For my first hat, I decided to upcycle an old sweater – I didn’t see myself ever wearing this style again and the ‘material’ screamed hat (or boot socks): Easton wasn’t as impressed with this hat as much as the one I whipped up yesterday so I tried it on myself and was happy to find that it fits me, too! The sweater knit is pretty stretchy (and I used smaller seams) so it’s not too surprising that it fits me as well. As for the sewing, it may have taken me an entire 10 minutes to make this – I did skip the band and used the finished ribbing at the bottom edge of the sweater which made it go even faster. It snowed today – guess what I’ll be sporting when I venture outside? This entry was posted in General on December 30, 2014 by stacy. 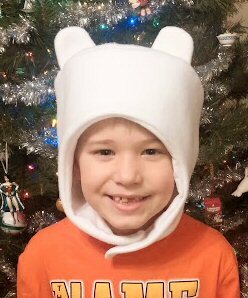 Get Your Finn Hat On! The Cartoon Network has a clever way of marketing their Adventure Time products to kids – a catchy little song comes on about 5 minutes before the show starts (you can view it in the link) where every popular character from their channel is wears a Finn Hat. Right before Christmas, Easton started asking me to make one, but because I was still sewing for the holidays, I never got around to it…. until this weekend. In comes my Adventure Time Crafts book to the rescue (you might remember this title from the cool little pearler bead coasters Easton and I made)! My only chief complaint about this project is that you have to enlarge (250%) the pattern pieces…. I hate using a photocopier to try to blow everything up – I generally waste tons of paper trying to maneuver the book around to get all the pieces oriented in the right direction. After about 20 minutes of fiddling with everything I was ready to cut into my fabric. I used 3/8 of a yard of microfleece for the exterior and 3/8 of premium felt (it is much thicker and looked less likely to pop a hole during repeated wear) for the lining and found that I could get two Finn hats from this yardage (you might need a bit more for the Fionnas since her ears are much larger). I did make a few changes in sewing this one up. First off, I left an opening in the back lining for turning – I thought it would be less conspicuous than leaving an opening in the back. I also machine stitched the ears (this was definitely a bit tight and more difficult to do, but I thought it would look nicer since my hand stitching is awful and be a bit sturdier over time) and the Velcro (why in the world would you want to hot glue it?). The instructions did not give a seam allowance for this projects that I could find, so I went with 1/4″. As you can see, Easton’s new Finn hat is a hit (and for a total cost of $3.80!)…. Now he’s asking for a backpack. Good thing I have instructions for that too! This entry was posted in General on December 29, 2014 by stacy. Believe it or not, here’s still time to make your little girl a Christmas dress (and don’t forget the boys – here’s a tutorial for a Quick-and-Easy bow tie)! 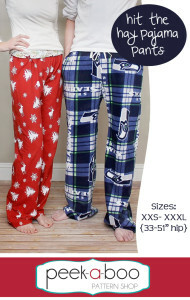 Looking for a way to keep your kids snugly warm Christmas morning? Stitch up a minky-lined robe. Need a last minute outfit? This party shrug is put together in a flash! Pair it up with this 20 minute pencil skirt and you’ve got a complete look in about an hour! The exact excuse I needed to eat a box of Oreos…. I needed the wrapper to create a bag! Need a quick ornament to give to a fellow sewist? This zipper version is absolutely adorable! Have a hard time getting your child to bundle up? They won’t refuse a fun, faux-fur hood like these or grab an old sweater and upcycle it to make one of these pixie hats! For the crazy cat ladies in your life – a tree decorated just for them! If I had the room, I would have made these giant floor pillows for the kids instead of breaking down and buying bean bags. Decorate your table or tree with these beautiful German paper stars (this might be a good craft to keep the older kids occupied while waiting to unwrap presents). Dress up your holiday table in no time when you add this 30 minute table runner to your buffet or counter. The start of the new year is a great way to get your house organized. 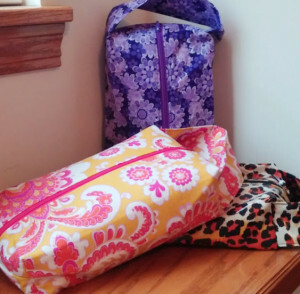 Get a head start and whip up a few of these mesh laundry bags. Looking for a super quick stocking stuffer? Grab a potholder and a few plastic baggies and make a quick caddie. This entry was posted in General on December 24, 2014 by stacy. I will be the first to admit, this picture is far from exciting…. 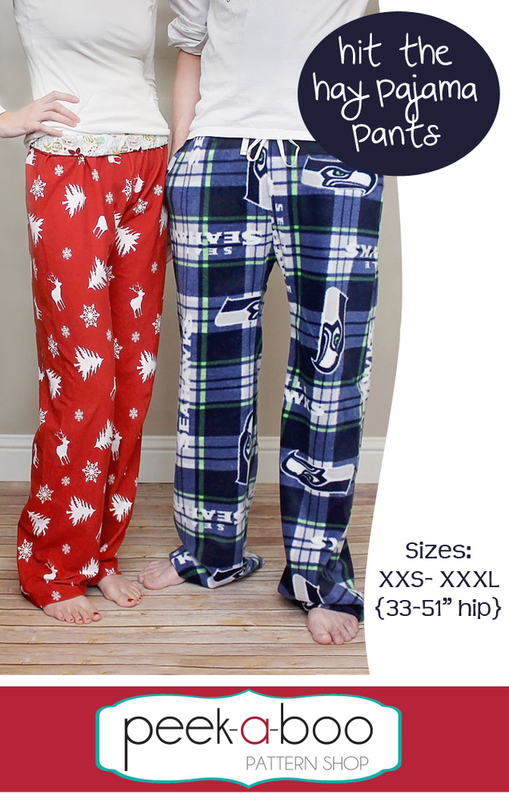 But, another pair of pajama pants are in the can! This is another version of the Hit The Hay pattern I made last week. 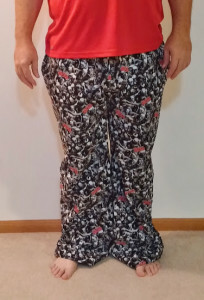 This time around I made a Walk Dead print pjs with pockets and a long length (with an extra 1″ added to that). He also wanted them lower rise (because way too many pants come up above your belly button) so I did the same ‘trick’ as what I did to mine where I skipped the contrast waistband and just folded over the main fabric to create a casing for the elastic – I don’t think it worked as well with his because in the end they seem way lower that what I anticipated. He also wasn’t a fan fan of the leg width – he said they are too bell bottomy for his taste. So this pattern isn’t quit a winner for him – in the future I’ll probably go back to my tried and true favorite, McCall 3019. This entry was posted in General on December 22, 2014 by stacy. I almost called this post: “The Pajamas That Almost Didn’t Happen.” You see, when I first spotted Wonder Woman flannel early this fall, I knew that I had to turn this fabric into pajama bottoms…. so I snagged 2 yards thinking this would be plenty. If I would have paid more attention when I bought it, I would have noticed that they were 45″ wide so there wasn’t going to be nearly the amount of material needed to make a pair – of course, I didn’t realize this until the other day after I went to cut into it. After looking at several stores, I finally found enough yardage to make a second leg! I skipped the contrast lining on the waistband. I don’t see myself ever folding it over nor was I going for the drawstring waistband – so I just serged the top edge of the material, folded it over to the wrong side of the pants, stitched & inserted the elastic. I didn’t have 1 1/2″ elastic so I used 1″ which is what I had on hand. 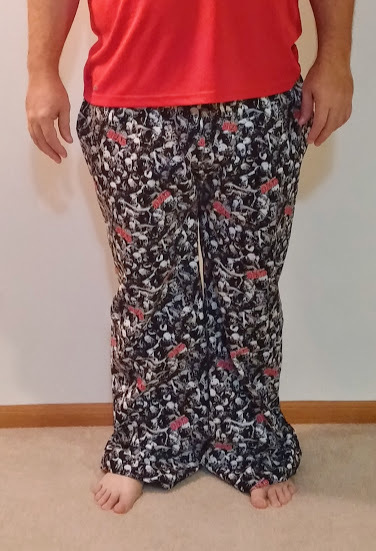 I did’t like how the pants were hemmed (folding over 1/2″ then folding it again 1″) so I split the difference between the total fold (5/8″) and did it twice to create a finished edge. As for the fit, it’s very roomy. The legs are much wider than other pj bottoms that I’ve sewn so if you’re looking for something ‘slimmer’ I’d opt for a different pattern. They are also plenty long on me (I could have easily gone with the ‘short’ length), but overall the fit is good. This entry was posted in General on December 19, 2014 by stacy. Looking to add some faux fur into your wardrobe? This over-sized coat is a perfect option (and looks chic too) or go with a smaller project like this cute, (adult) trapper hat. Sew a luxe robe to wear Christmas morning. It’s projects like this glitter gummy bear that makes me with that I knew how to crochet. You don’t need it to be snowing outside to have a snowball fight – just make your own! Perfect for gift baskets or just to bring a bit of holiday into your kitchen: Hanging Kitchen Towels. 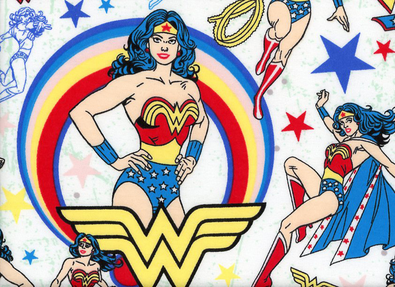 Looking for a last minute gift to sew for the woman who has everything? How about a pretty, custom wallet? The (originally priced) $12 pencil you can knock off for yourself – makes a great stocking stuffer! Last minute gift sewing doesn’t need to be stressful, whip up a toasty fleece or faux fur infinity scarf in no time! Give the gift of ‘spa’ this holiday season with a DIY Heating Pad. Who needs to drag out tons of pillows and blanks to make a fort? This Bunk Bed version is all sorts of awesome. Just because you have a boy doesn’t mean you have to skip handmade this Christmas – whip up a Big Boy Tool Belt for the guys in your life. The best thing about this fun penguin potholder is that you can keep using it way after the holidays are over! Make gift bags in the size and print you need when you make your own sacks and piped fabric baskets. Cute little dolls that any little girl would love to find on Christmas morning. This entry was posted in General on December 18, 2014 by stacy. Did you know that if you change up the dimensions of your box bag (and skip the handle), you get a cute little pencil case instead? It’s the perfect size for writing implements, sewing tools, and as I discovered yesterday, tubes of lotion! 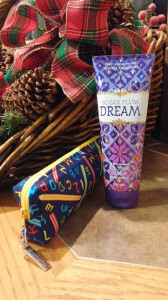 Instead of using those cellophane bags tied off with a logo ribbon, I decided that individual lotions should be wrapped up in pretty, mini cases instead! I topped this one off with a handmade zipper pull, put a gift tag on it and it’s all set to go – no gift bags are even needed! This entry was posted in General on December 17, 2014 by stacy. Up next… gifts for the teacher (and a holiday birthday present thrown in the mix)! Yes, that’s right, it’s Box Bags! I love giving these as gifts because almost everyone could use a new pouch and they are the perfect size for stuffing with bath products. This time around I changed things up a bit and made one water repellent I used a laminate for the exterior and a ripstop nylon for the lining. I’m hoping they take it with them in the shower and test it out so I can hear if it gets leaky or not. Guess what’s on the agenda today? Just a few more of these beauties! I realized that I had forgotten to make Taylor’s coach a present and had one more present on hand to ‘gift wrap’….. then it’s on to pajamas! This entry was posted in General on December 16, 2014 by stacy.